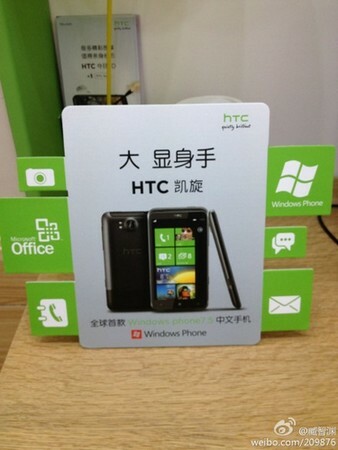 Windows Phone 7 has started invading China and to your utter surprise it is HTC that has brought this handset to the Chinese market with the pre-launch of the Triumph, reports Engadget. The Triumph is the first handset to enter the market and is well known as Titan in the West. The device is open for pre-order that customers can place for 4,399RMB ($700). The device will come running Microsoft’s latest mobile operating system, Tango or Windows Phone 7.6. Although, the new operating system has been designed to target the inexpensive devices, the Triumph tells us a completely opposite story. Zang Zhi Yuan of Sina Tech broke the news of the handset, which is taken as a surprise considering the fact that Nokia’s Lumia 800 was generally expected to be the first Tango device to launch in the country. Undoubtedly, Lumia was the handset being used as the reference point to assume the features of the OS that would be replaced to support local services in the country. According to some reports, Nokia is going to introduce the Lumia in China somewhere this month. However, it is not yet clear what services will be exactly altered to make it suitable for local social media and Web services. HTC, the Taiwanese smartphone manufacturer is going through a tough time, as it posted a loss in profits for the first time in two years. However, the company is still hopeful with its major focus on Chinese market as it is planning to increase the number of retail outlets in the country. Apart from HTC and Nokia, there are other companies like LG and ZRE that are reportedly announcing Tango devices in China this month. One thing is sure that those devices will target the low-income customers compared to HTC. The signs are pretty clear that no company will have an easy going in the presence of such a tough competition.